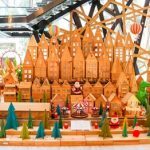 With the festive season fast approaching, EAST, Hong Kong has announced its Christmas lineup to see out 2018 in sustainable style. Encouraging playfulness and individuality, the city-centre hotel is a vibrant destination to spend the holiday with loved ones, and this year they’ll be giving and indulging in equal measure with eco-conscious decorations and lively celebrations. To complement the eco-decorations, EAST’s bustling café, Feast (Food by EAST), will be offering festive feasts on 24 and 25 December with sittings from 5:45pm to 8pm and 8:30pm to 11:00pm. Designed to encourage social dining and evoke a celebratory atmosphere, the unlimited menu will be served semi-buffet style, with a variety of antipasti, such as freshly shucked oysters and king crab legs. Main course options include traditional favourites, such as Slow-Roasted Turkey with Sausage, Sage and Chestnut Stuffing and Sautéed Brussels Sprouts with Bacon as well as Roasted grass-fed beef tenderloin with Roasted Bone Marrow, French Beans, Green Peas and Hand-cut Chips and more. The Feast Christmas menu is priced at HK$728* per adult, and HK$364* for children under 12, who will all be treated to a surprise gift. New Year’s Eve 2019 is set to be one to remember, with a specially curated menu at Feast. Priced at HK$668* per person and HK$334* for children under 12, the Feast NYE indulgence will take place from 6:00pm – 10:30pm on 31 December, with gourmet highlights including Whole Poached Boston Lobster with Truffle Mac n Cheese, Roasted Grass-fed Beef Tenderloin with Roasted Bone Marrow and Handcut Chips and more. Raising the tempo of the evening and carrying guests through to the strike of midnight, the party will continue at Sugar (Bar.Deck.Lounge), EAST’s vibrant rooftop bar. Themed ‘City of Stars,’ the New Year’s Eve celebration will draw inspiration from the box office hit movie, La La Land, combining fabulous cocktails, jazzy tunes, and sweeping views across the city.